On Saturday, December 1 at 2:00 p.m., pioneering death educator and Before I Die NM Festival coordinator Gail Rubin will be interviewed on KKOB News Radio. She’s scheduled to be on the Jeffrey Candelaria Show for an hour. You can find KKOB News Radio at 94.5 on the FM dial, or 770 AM in Albuquerque, NM, or listen live online through this link. When is the best time to have a conversation about funeral planning? What tools are available to help people discuss end-of-life wishes? How do people avoid leaving a mess for their loved ones after they die? What happened at the Before I Die New Mexico Festival this year? The five things you must know NOW about anyone for whom you might have to plan a funeral – what are they? The cost of funerals and memorial services. Some of the new trends in death care. What do you need to do to donate your body to science? The status of physician aid-in-dying in New Mexico. The Before I Die New Mexico Festival drew more than 685 participants to 22 events in Albuquerque, Santa Fe and Belen. Events included speakers, tours, movies and a party in a cemetery. 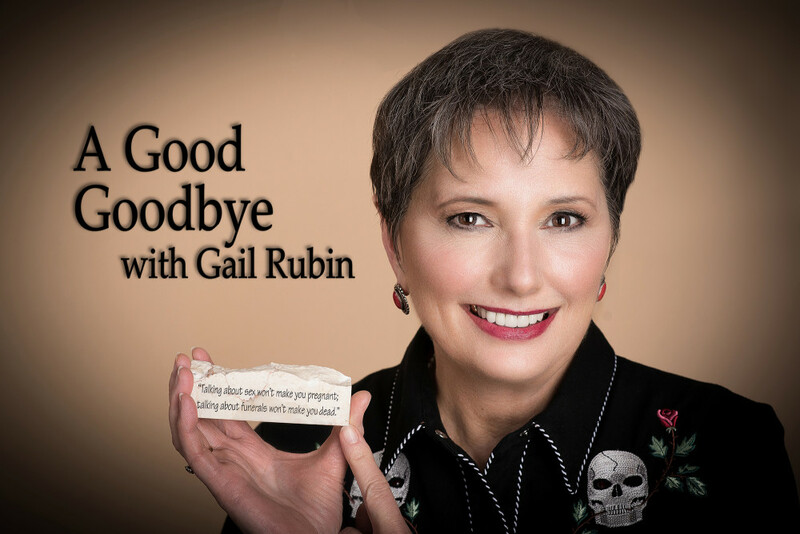 Gail Rubin, CT, is a pioneering death educator who uses humor and funny films to teach about end-of-life topics. An award-winning speaker, she “knocked ’em dead” at TEDxABQ in 2015. She’s the author of three books on end-of-life issues: A Good Goodbye: Funeral Planning for Those Who Don’t Plan to Die, Hail and Farewell: Cremation Ceremonies, Templates and Tips, and KICKING THE BUCKET LIST: 100 Downsizing and Organizing Things to Do Before You Die. She’s also an informed advocate for planning ahead, a Certified Funeral Celebrant, and the coordinator of the Before I Die New Mexico Festival. Download a free 50-point Executor’s Checklist from her website, www.AGoodGoodbye.com.